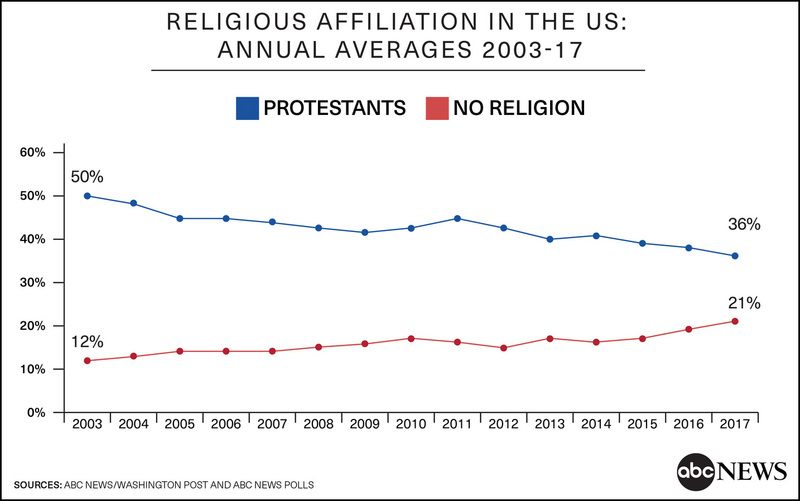 The decline has been pretty evenly spread among young and old; college and high school grads; men and women; liberals and conservatives; and both mainstream and evangelical Protestants. However, the decline is much larger among whites than among blacks or Hispanics. And the share of people who self-ID as Catholics has stayed steady. The first decade of the 21st century was a tough one for evangelical Protestants. Their numbers fell, their political influence waned, their most popular leaders died off or retired, and they got badly crushed on the issue of gay rights and gay marriage. By 2012 the movement was in pretty sorry shape, and it only got worse after Obergefell. Then Donald Trump came along and threw them a lifeline. Sure, he was a philanderer, a faker, a liar, an avatar of mammon, and very plainly not a religious man himself. But Trump made evangelicals the same offer he makes with everyone: he’d adopt their causes as his own and fight for them publicly, but only in return for unconditional public support. Maybe it was a devil’s bargain, but they took it. If you had lost 20 percent of your followers in the past decade and watched helplessly as modern culture steamrolled nearly everything you believe in, you might have too.